A storm packing dangerous winds is set to bear down on Nottingham and the surrounding areas on Friday. 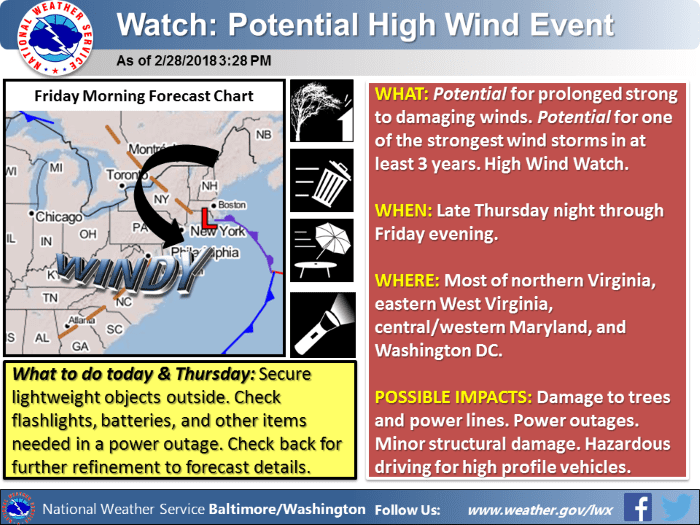 The National Weather Service says that High Wind Warnings are in effect from the Potomac Highlands to the Chesapeake Bay from Thursday night through Friday night. 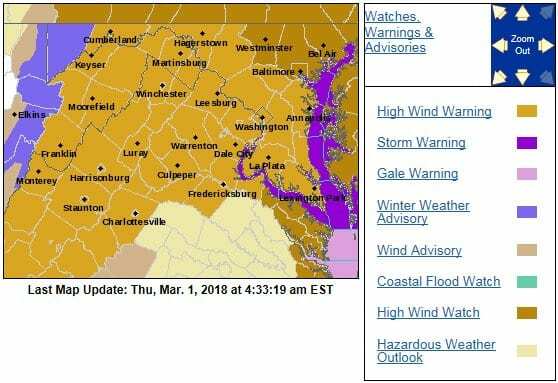 High Wind Watches are in effect for northeastern Maryland for the same time period. Many can expect winds of 25 to 35 mph with gusts over 60 mph causing power outages. The Maryland Department of Transportation State Highway Administration (MDOT SHA) is evaluating rapid response equipment such as chain saws, chippers, as well as inspecting drainage ditches in advance of the storm. The ground around much of the state is saturated, so additional rainfall and high winds can topple trees and create power outages. MDOT SHA urges drivers to get as much information about conditions and make smart travel decisions Friday morning. The Maryland Transportation Authority (MDTA) is advising motorists who are planning to travel on Maryland’s toll bridges to check wind warnings and restrictions criteria by clicking here. • Keep a close eye on local information sources for the latest weather conditions and plan accordingly.